Alpamayo, standing at 19,512' in the heart of Peru's Cordillera Blanca, is without a doubt one of the most beautiful mountains in the world. The climbing on Alpamayo is world class, offering an exciting blend of expedition and alpine climbing. Approach Alpamayo through the stunning Santa Cruz Valley, a world class trek on its own. Enjoy the spectacular alpine climbing of the French Direct route on Alpamayo's southwest face, ascending the steep snow and ice gully to reach one of the airiest summit ridges in the world. Experience the ultimate alpine climbing expedition, benefiting from comprehensive logistics with mule support and excellent cooking at Base Camp, and a 2 to 1 climber to guide ratio that ensures personal attention and support on this demanding climb. Our Alpamayo Expedition begins in the foothills of the Peruvian Andes as we travel from Lima to the town of Huaraz, the gateway of the Cordillera Blanca. 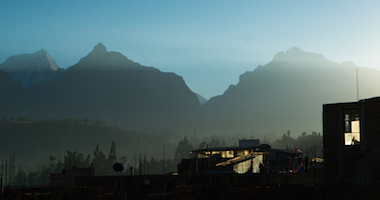 From Huaraz, we head into the mountains and make the two-day trek into a spectacular hanging valley below Alpamayo. Mules help transport our gear to Base Camp, allowing us to make the trek with light daypacks. 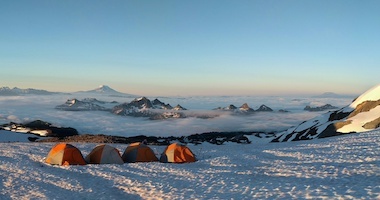 After establishing Base Camp, we begin moving our climbing gear higher on the mountain while we acclimatize and review the skills and techniques needed for the climb. We establish two successive camps on the lower slopes of Alpamayo, with our high camp at 18,000'. Summit Day on Alpamayo is one of the most spectacular days of alpine climbing anywhere. We ascend multiple pitches of steep neve and ice via the French Direct route on Alpamayo's beautiful southwest face. Our Alpamayo Expedition is for climbers looking for an exciting and classic alpine climb. 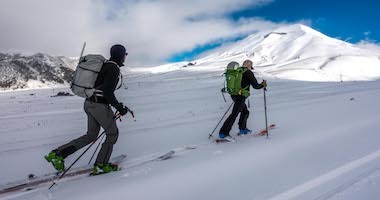 Alpamayo involves a steep face, preceded by an intricate glacier; prior knowledge of roped travel, ice climbing and crampon techniques, and ice axe arrest is required. 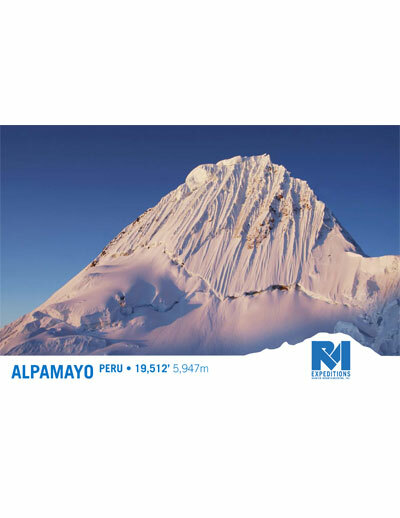 Our Alpamayo Climb is led by RMI's top guides, who bring with them years of climbing experience on mountains all over the world, from the Andes to the Alaska Range to the Himalayas. As you reach higher elevations and test the limits of your experience, the value of an accomplished, highly trained RMI Guide held to our standards cannot be understated. We climb Alpamayo with a 2:1 climber to guide ratio to provide the important individual attention needed during the training and the climbs. Safety has always been RMI's top priority and we strive to create the safest mountain experience possible. RMI's experienced team of guides focus on leading a fun and successful climb without compromising safety. 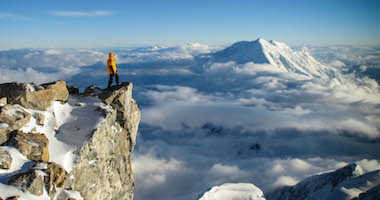 We apply the same strict standards of safety we bring to the Alaska and the Himalayas to our climbs of Alpamayo. Careful planning, precise ascent profiles, daily weather forecasts, and diligent attention are taken as we venture to high altitudes. Comprehensive medical kits, rescue equipment, and radio and satellite communication equipment are carried with the team throughout the trip. After breakfast we load our vehicle and make the drive back to Lima. We arrive Lima in the late afternoon and transfer to the airport to catch evening flights home. 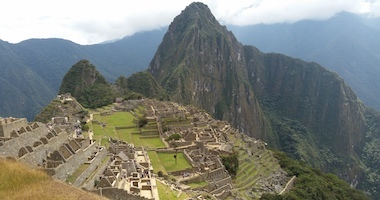 Peru was once part of the great Incan Empire and later the major vice-royalty of Spanish South America. It was conquered in 1531 - 1533 by Francisco Pizarro. On July 28, 1821, Peru proclaimed its independence. For a hundred years thereafter, revolutions were frequent. Political unrest, border conflicts and Maoist guerrilla group dominated Peru's history through the middle of the 20th century, but the country now stands as a democratic republic with a multi-party system, headed by a president. When entering a shop or home, politely use a greeting such as buenos dias (good day), buenas tardes (good afternoon), buenas noches (good night). Similarly, upon leaving, even if you've had only minimal contact, say adios (goodbye) or hasta luego (see you later). Peruvians usually shake hands upon parting as well. Peru's official currency is the Peruvian Sol (PEN), divided into 100 centavos. Check a financial newspaper or www.xe.com for the current exchange rate prior to departure. We suggest bringing $300-$400 total for personal spending money including restaurant meals, drinks, pocket money, and the Support Staff Tip Pool. This trip is open to all individuals in excellent physical condition with previous climbing experience. Successful completion of an RMI Expedition Skills Seminar on Mt. 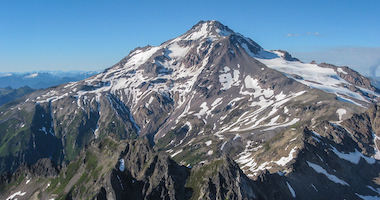 Rainier, in Alaska, Peru, Ecuador, North Cascades, or an equivalent multi-day mountaineering seminar is required. Knots & slings - prussik, butterfly, Munter, etc. One set of technical ice climbing tools. An ice screw holder to attach to your harness for securely clipping ice screws or ice tools while climbing. Optional but highly recommended. For clipping into anchors. A pair of lightweight, insulated pants are ideal for extra warmth and comfort at camps, both on the glacier and on the trail. A knee-length pair of gaiters, large enough to fit over your hiking or approach boots. This will protect you from catching your crampons on loose clothing. On Alpamayo you will need 10 mountain lunches. All of your mountain lunch items should weigh 5 - 6 lb. Deposit Payments: A deposit payment of $2,000 per person secures your reservation. Deposit payments $2,500 or less may be made via MasterCard, Visa, e-check, check, or wire transfer. Deposit payments over $2,500 must be made via e-check, check, or wire transfer. The $2,000 per person deposit is non-refundable. Written notification is required for all cancellations. If you cancel 120 or more days before the start of your program, program fees will be refunded less the non-refundable $2,000 per person deposit. * Accommodations are based on double occupancy. Single Supplement Fee will be charged to those occupying single accommodations by choice or circumstance.